Weedeating around the bunkers about a foot to trim the grass. Use a reciprocating blade on the steeper banks to cut the runners or the edge of the turf back. On the shallow side of the bunker, a spade shovel must be used to dig down deep enough to cut the runners. The material is pulled out by hand and or rakes. The bunkers have all foreign material blown out of them. Sand is pushed by the bunker rake from the low end of the bunkers to the upper ends to redistribute the sand and to help place sand on the faces that have washed down.. 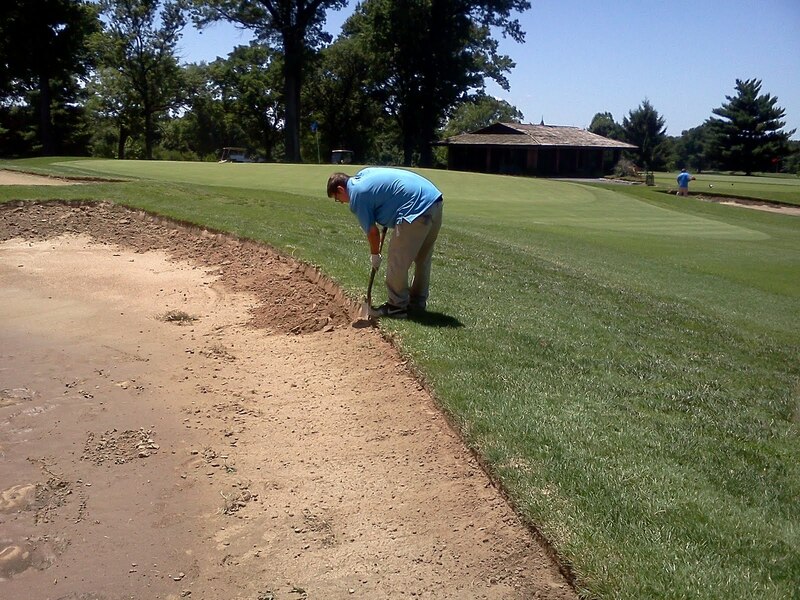 If additional sand is needed, it is added to the bunker. The bunkers are raked and the edges are hand raked to provide a smooth finished look. 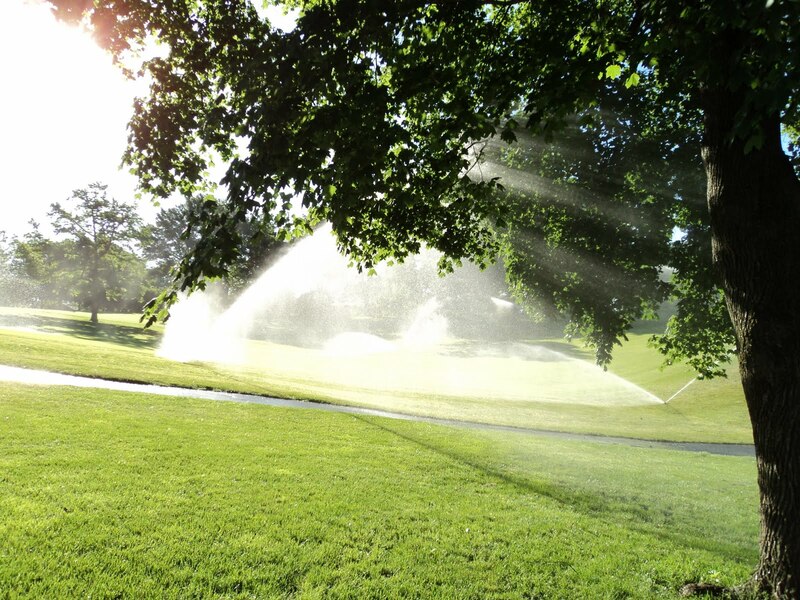 Utilize a PGR(Plant growth regulator) to reduce the growing habit of the runners. This is a time consuming and exhausting job for our crew but as we talked about in our meeting this morning, the finished product looks great. 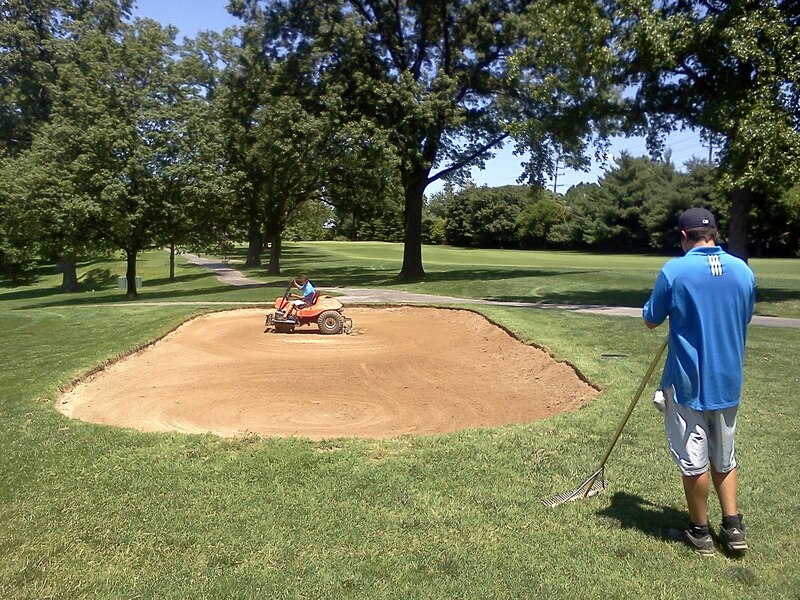 Weekly maintenance of our bunkers includes raking, blowing materials out of the bunkers and trimming the edges and surrounds of the bunkers. Every couple of weeks, we do a light edging with weed-eaters and the reciprocating blades to reduce the runners that creep back into the bunkers. We will probably do another heavy edging in late summer that should last the rest of the season. Jeff using a spade shovel to cut the runners on the less severely sloped areas of the bunker. 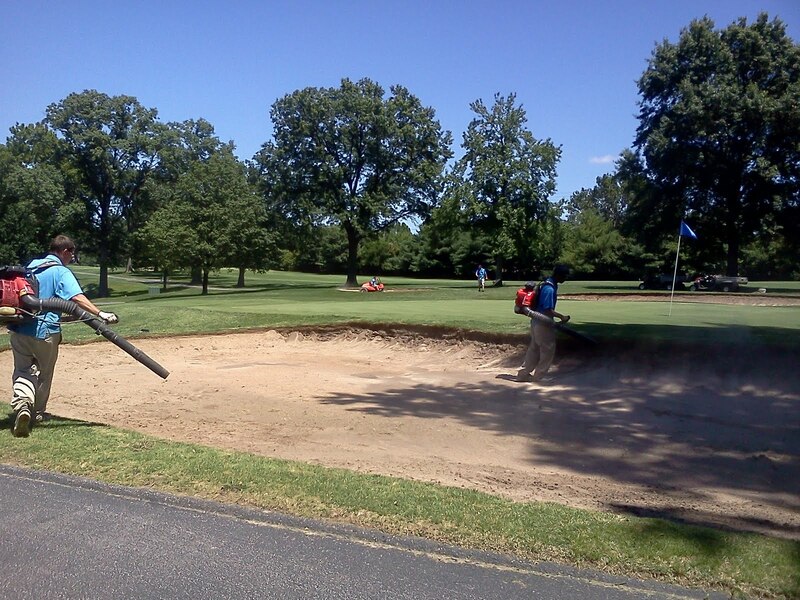 Jeff and Demarcus blowing the foreign material out of the bunkers. 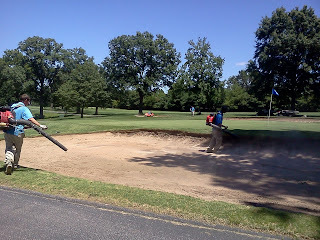 Tom Lewis raking the bunker and Joe Scanio waiting to rake the edge smooth. 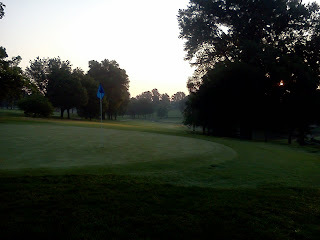 Course opening at 10:00 a.m. The course will open at 10:00 a.m. after it has a chance to drain some and we were able to clear debris, pump bunkers and do some general clean up of the course. The course is very wet but the greens are reasonably solid. Additional storms in the area could delay the opening and or close the course at any time due to our current wet conditions. Lower side of wall on #10 was pushed over by the flooding overnight. 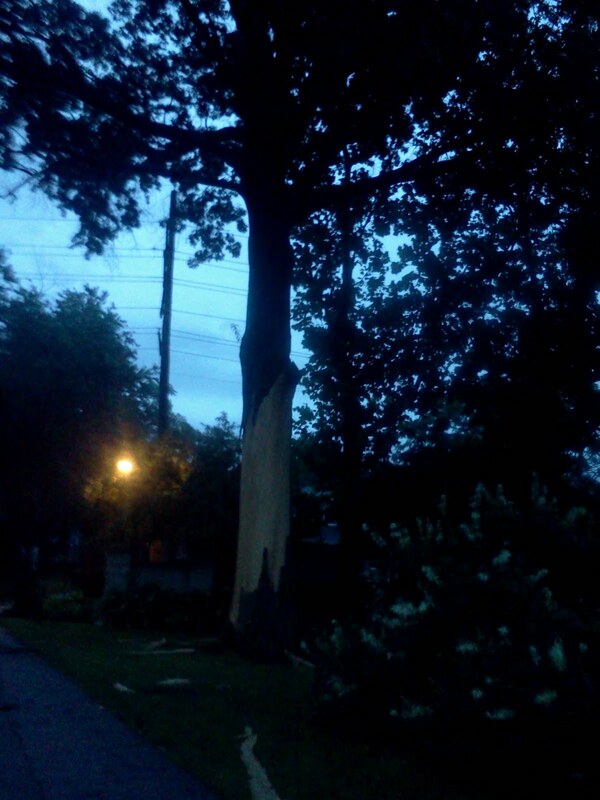 Beautiful Pin Oak at the Lucas and Hunt entrance took a direct lightning strike in last nights storm. Almost 4" of rain. Course is closed for now to allow it to drain. Will evaluate at 10 regarding the rest of the day. I apologize for my delay in speaking about Elvis II that was born earlier in the spring and has since left the nest. (Thank you very much). He was a little quieter this spring than Elvis I last year but he is beginning to call out which really is great to here. 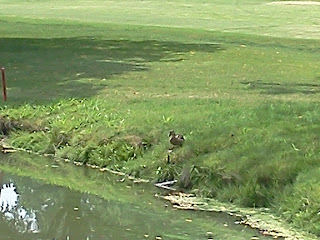 Mr Bob May played last Saturday and took this great picture of Elvis II or probably his mother along #18. I watched them earlier this week doing this ritualistic hopping exercise which was very interesting. The blue tee renovation on #13 was completed Friday afternoon. It included the same process as #4, tilling of the tees, laser leveling and then using a tractor and many crew members to help lay out the big rolls of sod onto the tee. The soil was beginning to soften throughout the middle due to the amount of moisture in it so we had to roll the roll out next to the tee and then a multiple members of the staff would pull it onto the tee. The tee after rough grading the day before by Skip. Mike McNeil from Laserturf Leveling doing the finish leveling of the tee. The tee will drain from front to back and from right side to the left side. The staff laying the fescue sod on the tee surround. The tee top has already been completed. The finished product. I think it fits in much better in the landscape and will provide many differing playing locations. It ended up about 30' across and about 44' in depth. The view from the front of the tee. My intentions are to have the tee open for the Invitational in 19 days. The red tee on #4 was laser leveled on Thursday, I laid part of the sod on Thursday evening and the staff completed it on Friday. Level is a relative term when you place grass on dirt. In some cases, tees are built like greens where there is a sand layer which allows for the surface to dry more quickly. Also, the type of grass warrants additional drainage such as bentgrass which we see to the north of St. Louis and in the cooler areas of the east. 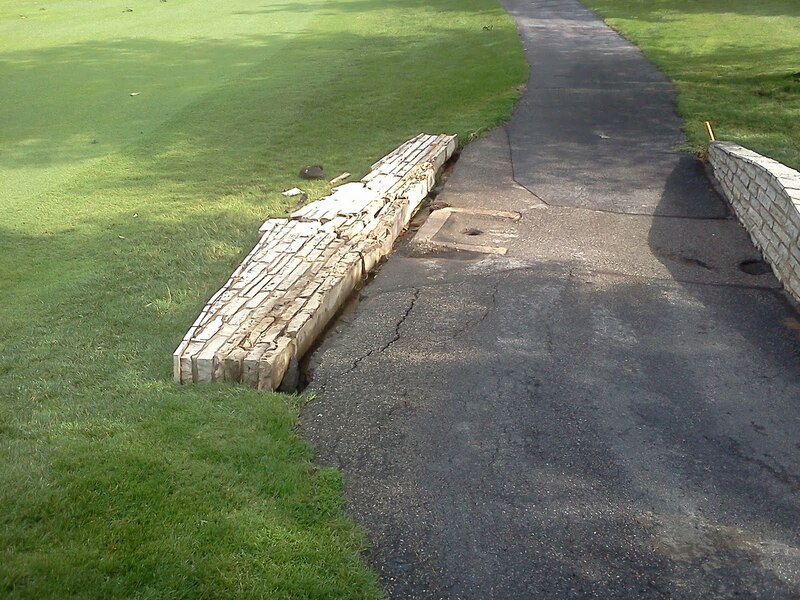 Some tees are installed with drainage which can be very expensive and some are not. Our tees are built on top of soil so we must insure that they surface drain which means when the laser leveling takes place, the tee is shaped so the water will drain from side to side, front to back and or back to front. There are design principles that are used to determine which direction you want the water to move based on how the land falls either up or down in front of the tee or the surrounding vicinity of the tee. Usually you want the water to drain away from the walk on and off area of the teeing ground so that players are not walking through a wet area. Schaefer Meyer/Laser Turf Leveling tilling the soil to assist the laser leveling operation move the dirt from side to side and back and forth. 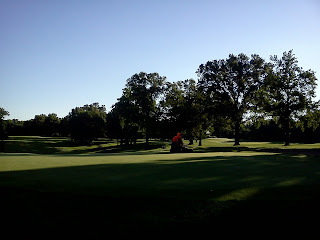 Sorry, no picture of the laser operation on #4 but this is how it is done from the work on #13. The yellow unit standing on the tri-pod sends out a signal to receiver on the tractor. Mike inputs the degree slope that he wants and the direction that he wants to slope to go before he starts grading. The unit then sends a signal to the tractor which then automatically raises the grading part of the box on the back of the tractor up or down depending if the area needs to be raised or lowered. He goes around in circles until the receiver shows a neutral line across it which of course means it is level to the desired slope requested. We expect to have great conditions all season long but I don' t think you will see much better from tee to geen and fenceline to fenceline than you will see now. Weather is awesome as well. Course is beginning to firm, fairways are full and firm and ball roll on our greens should be improving with the lower humidity. 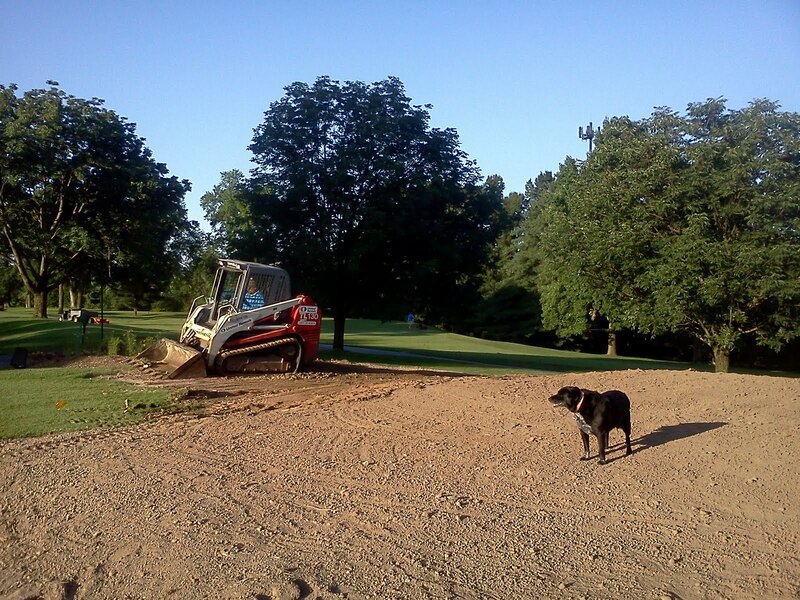 13 Tee final stages of renovation are happening today and tomorrow. Skip is doing some finish work on the tee banks this morning and the láser leveling will take place as well on both # 4 red tee and the new blue 13 tee. Sod is arriving in the pm with a majority of it being laid on Friday. Well, we rented a skid steer and worked Friday morning on the tee until a toad strangler rain came along and stopped us in our tracks so to speak. Rented the skid again late yesterday afternoon and got about 1.5 hours in this morning and was stopped by .10" of rain. Not much rain but just enough to mess with our plans. We hope to do some additional work tomorrow, rain dependent and then have the tee laser leveled on Thursday or Friday. We plan to have it sodded before the weekend is over to allow it to grow for the next few weeks before the beginning of the Invitational. We also plan to laser level the 4th red tee as well. One of the things I forgot to mention in our presentation last week at the membership meeting. New #13 blue tee looking from front to back. As you can see when you are out playing golf, there is no fountain in #9 lake. Normally we will put the fountain in the lake around the end of April. This season, we delayed the date for a few more weeks. 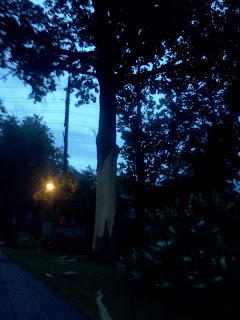 We had some electrical issues that we were facing and needed to make the repairs. Other things took priority and it was pushed to the back burner. We finally made the repairs and attempted to get it started and upon installation, the fountain would pop a breaker and there was no power. Found out that the pump was bad and it is on order. Also, during the install, a plastic sleeve was broken and needed to be repaired as well. The fountain has been on order for at least 10-12 days and has not arrived. Our vendor is checking to see if it is back ordered. At this rate, we might have the fountain ready by the 4th of July. Thanks for your patience. Each season, we have taken one of our worst tees and renovated the tee to improve playability and maintenance. The blue tee on #13 was very narrow which did not allow for any yardage change in the hole, was built high off the ground and was not level. The forward white tee was built directly in front of the blue tee and was built at ground level which caused issues during rain events. The master plan recommended the tee to move over slightly and be enlarged and the white tee would then be moved in a more forward position..
We began renovation on the blue tee as of yesterday. As you can see in the plan below, the tee will be a more vertical tee with a depth of approximately 15 yards changing length on a regular basis. It will add 5 more yards in length to the scorecard and give us multiple teeing positions to the left, middle or right side of the tee. It will be moved to the left by 5 yards which takes it out of direct alignment of a large oak tree that continues to grow outward and narrows the driving lane of the tee. 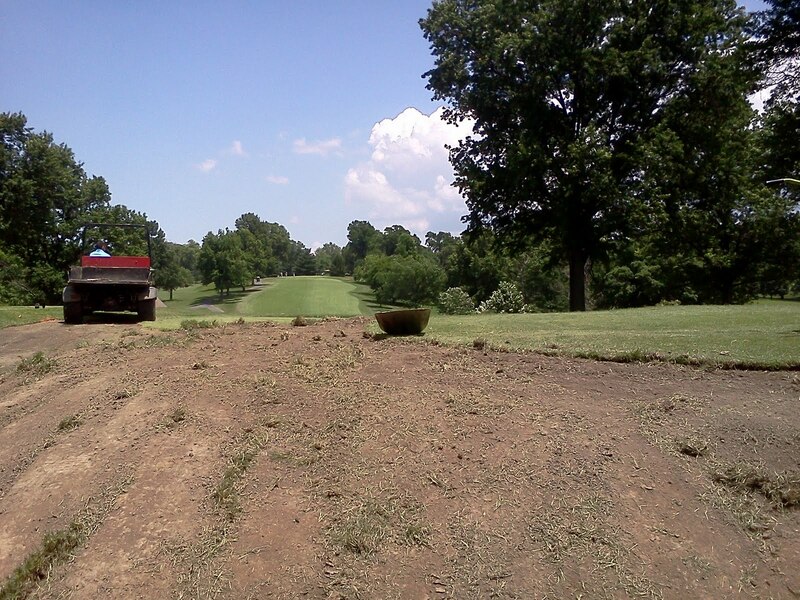 We expect to have the tee sodded by the middle of next week and it will open in time for the Invitational. The tee will be about 1'-1.5' off of the ground and will fit more naturally in the teeing area. The new white tee will be slightly forward and left of its existing location and will be constructed in late July/early August once the blue tee has been opened for a few weeks. I am still evaluating the walk path and planting bed at the tee area. Most everything except the steps will be kept in place at this time until we get the complex completed. During the off season, we might make some changes to the ornamental planting but we will wait on a slower time of the year to make this decision. In the meantime, we will utilize the tee that is on the left side of the complex that is used infrequently. I'm slow in announcing the renovation taking place at #13 tee. We are rebuilding the blue tee which will allow the teeing distance to change by 15 yards. Full details on the changes with a new rendering will be pn the blog tomorrow with some details also being discussed in my presentation during the membership meeting tomorrow evening. The white tee will be renovated at the end of July. The new blue tee will open in time for the Invitational. Momma mallard that laid eggs under the ornamental grasses along the back lot has brought her newly hatched babies to the lake between 10-15. I hope some survive but usually the snappimg turtles do a lot of harm. Well, we are in store for some mid summer heat for the next few days. First week where we feel like we accomplished everything we set out to do and the facility is showing it. Zoysia is really starting to move and so is the dreaded bermuda. What a great weekend of activity this past Memorial Day weekend. I don't remember a 3 day weekend like that since I have been here! Enjoy your weekend at the club. Yesterday evening was a perfect time to begin our fairway fertilization. The course was closed and the wind settled. We are a couple of weeks late with this application due to the cooler than normal weather conditions and rain that we experienced. As a part of this application, we must water in the product to keep some of the quick release ammoniacal nitrogen from burning the turf. Usually a couple of turns of the heads is enough to get it activated and off of the leaf. The heat of the last few days has increased the soil temperatures which is important for zoysia grass to begin its normal growth cycle. We will use about 5,000 pounds of fertilizer material on about 25 acres for our initial fertilization. The rest of the summers application will be applied when we spray our Plant Growth Regulator(PGR) to keep the zoysia compact in its growth habit. Less growth means less clippings which provide for a better overall appearance after mowing. Without regulation, we would have to blow the clippings off of the fairways after each mowing that is completed in the early morning dew. We will throw some soluble fertilizer in with our regulator to give the additional fertilization that the zoysia will need to be healthy and strong. Water flying on #11 fairway to water in fertilizer. Allows oxygen to exchange with carbon dioxide that can build up in the soil. Moisture can penetrate more quickly into the green and can allow it to wet more evenly. Oxygen entering the soil also dries the surfaces which provide for firmer and fast conditions. 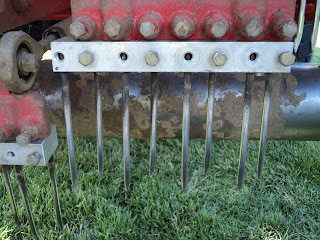 1/4" needle tines staggered 4 to a row and 2 rows per arm.